My family celebrated Christmas on Sunday at my parent's house. We slept in, opened gifts (my little brother, the Mac Genius, gave me an iPod Touch! ), served dinner for 13 people and ended the night with drinks and the company of a few old friends who stopped by. 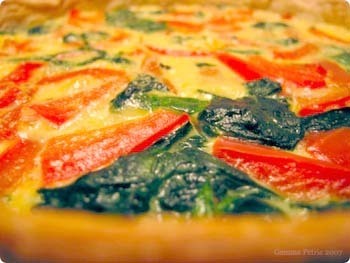 I only made one dish for Christmas dinner this year: A red pepper, spinach and feta quiche. This is one of my favorite standby recipes. It makes a quick and beautiful dinner or a lovely addition to a larger feast that vegetarians can enjoy as a main dish. And, it couldn't be simpler to prepare. Preheat oven to 425F, place a baking sheet on the middle rack. In a medium bowl, whisk the eggs and cream together. Reduce heat to 350F and bake another 20 minutes, until set. Watch carefully so that crust does not burn. Beautiful and delicious, Gemma! Not just the quiche, but your family Christmas celebration. Here's to a glorious 2008 for all of us!